Each year, 70 000 South Africans are killed by trauma, and a further 3.5 million seek trauma care. We analysed 1 465 trauma patients at the regional-level King Edward VIII Hospital (KE8H) in eThekwini Municipality. Mean patient age was 29 years. Peaks in patient numbers were observed mid-month, at month-end, between 08h00 and 12h00 daily and on Saturday and Sunday nights. Most injuries occurred on roads, at informal settlements and at bars/shebeens. More than 44% of injuries had a violent cause. The pattern of presentation was more in line with a primary healthcare setting than a referral centre. Reliable and accurate injury trend information is required for effective strategies to curb South Africa's high injury mortality and morbidity rates. Epidemiological databases are needed, as well as safe, robust and ethical systems for collecting, collating, analysing and disseminating non-fatal injury-related data. Deficiencies in trauma care are a worldwide problem owing to the difficulty of assessing the burden of non-fatal injury. Mortality statistics are used as indicators of violence and injury; however, nonfatal injuries exceed fatal injuries by up to 20 times.1 Non-fatal injury data in Africa rely on limited studies and population groups, resulting in a 'patchwork picture of the injury profile of Africa'.1 The lack of reliable statistics makes it difficult to assess the impact of societal changes on the rate of injuries or to compare South Africa with other settings. An assessment of the effect of non-fatal outcomes on the overall injury burden is needed. 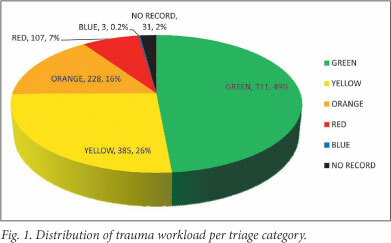 We studied the workload at a leading trauma unit (TU) in terms of temporal distribution of work, severity of workload by triage category and injury types. The study was conducted at the TU of King Edward VIII Hospital (KE8H), eThekwini Municipality, in August 2011. A data-capture form and time sheet were completed for every trauma patient seen in the unit over the study period. Approval was obtained from the Biomedical Research Ethics Committee at the University of KwaZulu-Natal. A total of 2 037 patients were examined, including 572 (28%) non-trauma and 1 465 (72%) trauma patients respectively. This translates to 17 500 trauma patients annually. Mean patient age was 29.47 years, and 63% of patients were males aged 18 - 35 years. 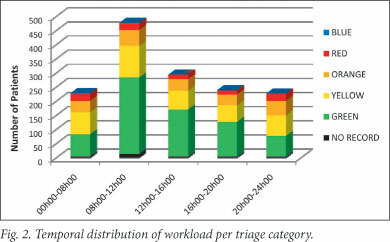 Classification of the workload included 49% green-code and 7% red-code injuries (Fig. 1). The trauma workload showed a bimodal peak, at mid-month and month-end weekends. There was no significant variation in day-to-day non-trauma workload. Injuries were presented as follows: 32.6% between 08h00 and 12h00, including 56.7% of green-code patients; 33.4% over the weekend, of which 24.7% were red- or orange-code; and 31.1% at night (20h00 - 08h00), of which 11.4% were red-code (compared with 5.4% during the day). There were 107 red-code injuries; 41.1% were seen over the weekend and 48.6% at night (Fig. 2). Workload over the 4 weekends of the study included 490 patients; 201 were seen between 20h00 and 08h00, and 9% had red-code injuries. The lowest number of patients was seen between 16h00 and 20h00 on Tuesdays and Thursdays. Violent and accidental injuries amounted to 38.9% and 38.6%, respectively, with 67.3% of all red-code injuries and 55.7% of all orange-code injuries attributable to a violent cause. Violent injuries accounted for 34.9% and 31.9% of serious and green-code injuries, respectively. Transport-related and self-inflicted intentional injuries accounted for 21.5% and 0.8% of the total injuries, correspondingly. The injuries of 31 patients were not classified (Fig. 3). Waiting times of 1 085 of the 1 465 patients were recorded. Green-code patients were examined within 60 minutes of arrival. Irrespective of triage category, trauma patients spent approximately 280 minutes in the unit and waited about 40 minutes before examination by the casualty doctor. After consultation, patients waited >90 minutes on average for review of their laboratory or radiological results. Red-code patient radiological investigations were performed and reviewed in less than an hour. There was no significant difference in waiting times on different weekdays. The estimated annual trauma patient load (>17 500) is comparable with that of the leading level-one TU in Gauteng (16 357).3 These units have similar demographic workloads with predominant age groups of 18 - 35 and 16 - 35 years, respectively.3 Of the 5 399 deaths recorded in eThekwini in 2007, the majority (1 310) were in the age group of 15 - 34 years.4 This group represents a significant proportion of the work force, highlighting the socio-economic consequences of trauma injuries. Orange-code patients should be examined within 10 minutes of triage (SATS performance threshold of 80%).7 In this study, such patients were examined within 18 minutes; only 32.8% were seen within 10 minutes. 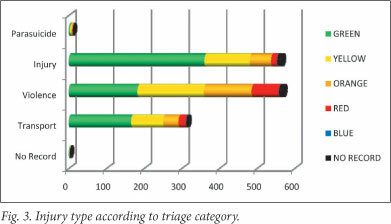 Yellow- and green-code patients were examined within 26 minutes of triage, and an average 30 minutes after triage, respectively. SATS advocates a maximum of 60 minutes (75% performance threshold indicator) for yellow-code patients and a maximum of 240 minutes (70% performance threshold indicator) for green-code patients. The long waiting times for the review of laboratory and radiological investigation results appeared to be the main reason for delays. Waiting times could have been reduced by: (i) point-of-care testing/satellite laboratories as opposed to centralised laboratory investigations; (ii) provision of a dedicated 24-hour pharmacy for trauma patients; (iii) keeping incorrect referrals to a minimum; (iv) patient education; and (v) primary care gate-keeping. However, the safety of potentially delaying the tertiary management of life-threatening emergencies has not been studied in such a setting. Earlier assessment of patients by senior staff could also significantly reduce waiting times; this is difficult to implement in an academic setting. Globally, injuries cause 5 million deaths per annum or 16 000 deaths per day. Five of the 15 leading causes of death in persons aged 15 - 29 years are unintentional injury-related.9 Deaths are a small proportion of the injury burden. Non-fatal health outcomes represent a larger component, with a substantial number of injuries resulting in potentially life-long disability, significant psychological trauma and financial loss. We thank Dr Sailuja Naidu for support, counsel and manuscript proof-reading, Dr S A Moodley (Acting Medical Manager, KE8H), Mrs P Bhadree (Assistant Pharmacy Manager, MOPD Pharmacy, KE8H), full- and part-time doctors and nursing and clerical staff at KE8H TU, Mr Xaba (Health Research & Knowledge Management Subcomponent, Department of Health, KZN), Mr C Naidu and Mr K R Pillay for assistance with data collection and processing.